Downtown freeways are unmitigated disasters for cities. They ruin the development potential of central city neighborhoods and create dead zones that divide downtown areas. That’s why Milwaukee, San Francisco, New Orleans, Niagara Falls, Oklahoma City, New Haven and Syracuse have either torn them down or are seriously considering it. But Birmingham, Alabama, is on track to take just the opposite approach. Under the advice of the Alabama Department of Transportation, Birmingham plans to widen its elevated downtown highway, I-20/59. ALDOT wants to spend $65 million widening 18 miles of this highway to six lanes at all points, based on the projection that traffic will grow 4 percent annually for the foreseeable future. (The project’s total cost, including redecking the highway, is $300 million.) The idea is to speed traffic through downtown on “Alabama’s busiest highway.” ALDOT also wants to widen a local road and remove some on ramps. What the opposition is sorely lacking at this point, Kelly says, is the support of Mayor William Bell. Almost 1,000 people have signed a petition asking the mayor to oppose the project. Kelly says the mayor’s whole legacy could rest on how the situation plays out, as could Birmingham’s future as a competitive, 21st century city. But so far, the mayor has been silent. ALDOT wants to take a bad idea and make it worse. They want to rebuild a bridge through downtown, when every major city in the country is looking for alternatives to building elevated highways. This is our city, and ALDOT should be working in unison with us, not trying to shove something down our throats because it suits them. A $700 million alternative proposal to sink the highway was dismissed by state leaders as “too expensive.” Perhaps if transportation officials eliminated plans for the $4.7 billion Northern Beltline, a literal highway to nowhere, there would be more money to invest in the core of the city. Angie Schmitt, thank you so much for giving this issue some exposure. I’m one of those I Believe In Birmingham agitators who is desperately working to give Birminghamians permission to imagine what a great city this could be before we lock ourselves in to another downtown disaster for generations to come. At this point we’ve just cleared the 1,000 mark on the online petition at http://Rethink2059.com, with more signatures on paper petitions. Streetsblog ought to support the underground option. Dropping the highway below grade was a good idea from the 2003 city center plan update by UDA of Pittsburgh. Turned out that was more than twice the cost, but the grades between Red Mountain Expressway and I 65 interchanges could not meet interstate standards. Moving the highway would be a 20-year, very complicated option. The elevated has to be replaced within a few years. Mayor Bell has the sense to know this project has no truly feasible options. The replacement I 20/59, if you really look at it, frees up space below (5-feet higher, many fewer columns, monolithic concrete (no steel, no bump-bump-bump), exit or entrance ramps. 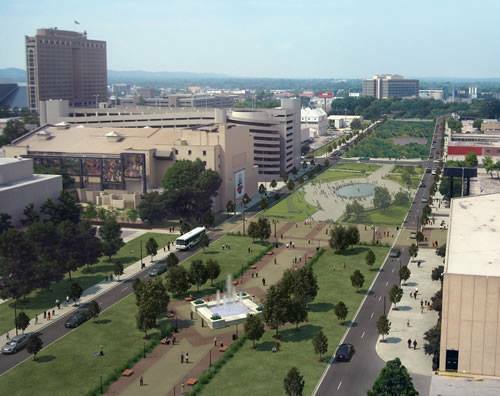 It can be made into a decent pedestrian passage between downtown and BJCC. Streetsblog would rather be peevish about vehicle traffic than try to actually improve cities. Rochester just converted part of its Inner Loop highway into a surface street, a similar project is underway in New Haven, and freeway teardowns are in play in many other American cities. Now you can add Kansas City to the list of places getting serious about removing a highway to save money, improve walkability, and open downtown land for development.